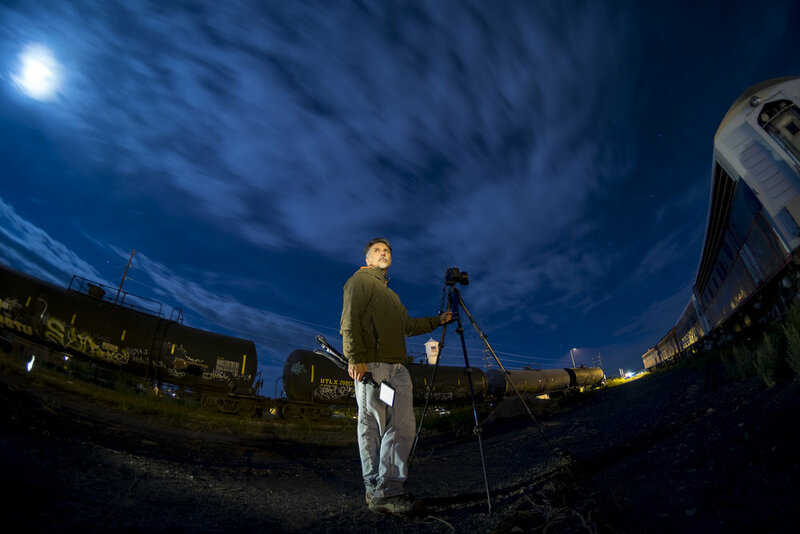 Making portraits at night is one of the most creative and challenging applications of night photography. In this post, I'm revealing some of the hardest-won lessons I've learned while honing the craft. Figure 1. "Gymnos at Gantry Park" (2012) from Night Paper. Nikon D700. 30 seconds, f/8, ISO 200. What truly defines the difference between a picture of someone at night and a true night portrait is incorporating elements that show a clear passage of time. In Figure 1, the soft water from a 30-second exposure adds a subtle note about time passing. Figure 2: Skyler at Barr Lake State Park, Colorado (2012) from my Night Paper project. Mamiya 7 II. 60 minutes, f/11, ISO 200 (Ilford XP2). Note the star and airplane trails in Figure 2. It's an extreme example, but drives home the point about dilating time. What truly fascinates me about this is our brains are wired to comprehend only the moment we are in. We cannot see time as it compounds in a long photographic exposure. But somehow, we can comprehend the resulting photograph. So cool, right? Figure 3. Star Portraits the night prior to the Atlas Obscura Total Eclipse Event in Durkee, Oregon. Photographed with a Nikon D750 with a LOMO Petzval 85mm lens. 22 seconds, f/2, ISO 6400. Your unique advantage whilst making night portraits is the duration of your exposure. Daytime portraits have hard limitations—exposure are all a fraction of a second. Figure 4. Light Painting Brushes Black Fiber Optic Wand on Coast HP7R. Nikon D750 with Nikon 70-200mm f/2.8 lens. 30 seconds, f/4, ISO 6400. Figure 5. Capitol Reef National Park (left), photographed with a Nikon D750 and a Zeiss Distagon T* 15mm f/2.8 lens at 30 seconds, f/4, ISO 6400. Olympic National Park (right), photographed with a Nikon D750 and a LOMO Petzval 85mm lens at 21 seconds, f/2, ISO 6400. Since I often shoot in National Parks and other wilderness areas, I choose to make humans small in scale versus imposing and inspiring landscapes. You can accentuate this by adding a flashlight or headlamp beam. Figure 6. My Night Paper and Noctavians projects. Various exposures. 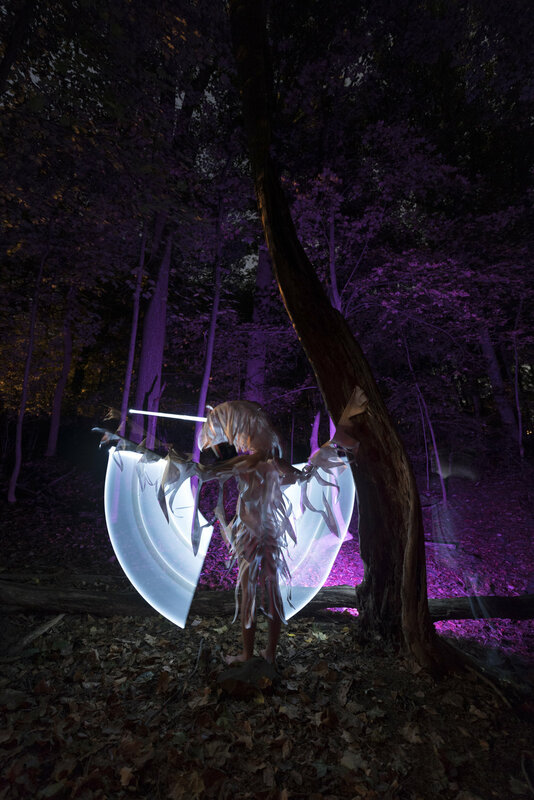 All incorporate a flash on the model's face, a flashlight for light writing or light painting, and sometimes a Luxli Viola via Bluetooth for brief, remote illumination. The most delicious night portraits I've made have crispy eyes and facial features. It's classic portrait technique. Where I depart from the traditional is keeping that shutter open and painting in from behind, underneath and the side to reveal things that move after the flash pops. 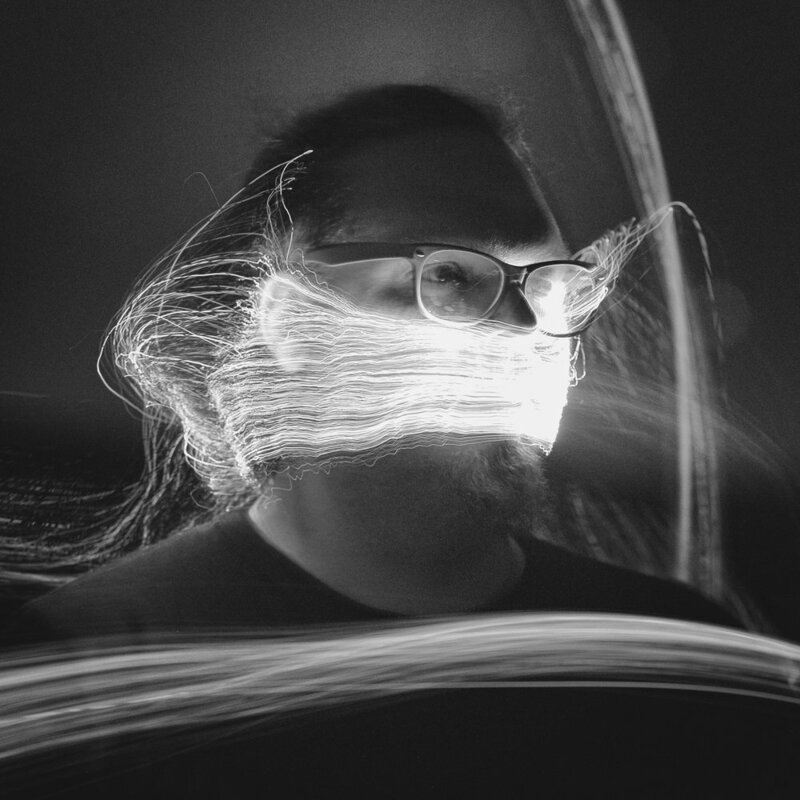 You can even have your model move away after the flash, achieving a "ghosting" effect by letting the light illuminating whatever was behind them to pass through the space once occupied by their body. You may ask, "Matt, can't I just use a flashlight?" Sure, but I recommend flash because even a quick burst from a flashlight isn't crisp enough to create the look I am after. Try both and you'll see what works for you. Figure 7. Two portraits I made of Lance Keimig during our Great Sand Dunes workshop. Left was lit with a Coast HP7R from behind and on his face. Right was lit by his camera's LCD. I strongly recommend that you get a flash meter to avoid the process of chimping your way to a proper flash exposure. It will save time, and batteries. TTL is OK, but I prefer something more consistent from one flash to the next. And not all TTL works well at night. Figure 8. 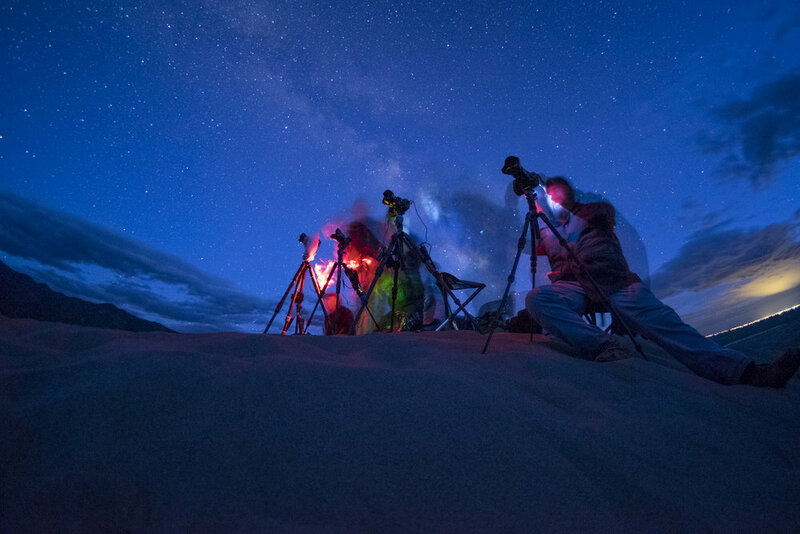 A second camera set for behind-the-scenes captured this beautiful moment during our Great Sand Dunes workshop. Our own expectations can get in our way. We can stifle our ability to make something unique by thinking too much and planning too hard. One of my most successful methods is to say, "OK, I got something I liked, now try something weird or random." Whatever I suggest here is likely to be my own taste and not yours. Find your experimental voice. And shout. Whisper. Cajole. Surprise yourself by letting the camera record what you cannot possibly see in a single moment. Figure 9. Michael Hollander from B&H using a telescope at the eclipse event in Oregon. Photographed with a Fuji X-T1 and a 7artisans 7.5mm Fisheye f/2.8 lens at 30 seconds, f/2.8, ISO 6400. Night portraiture is difficult. No joke. 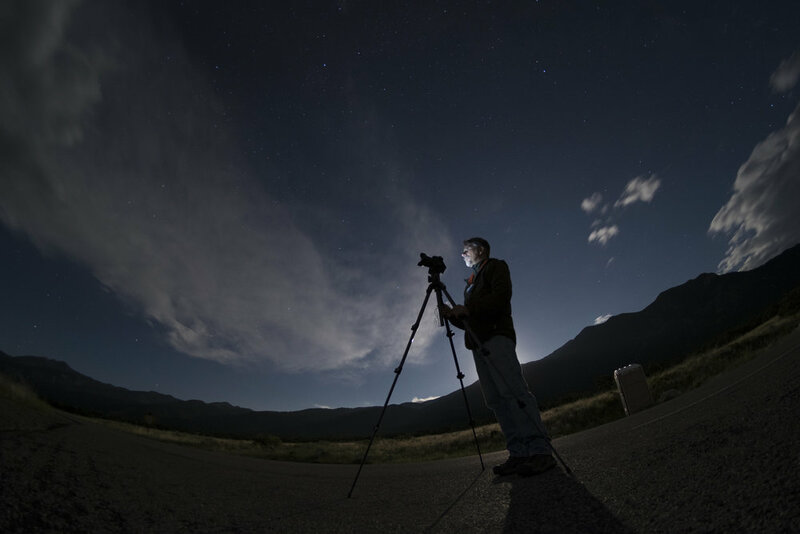 It requires mastery of the fundamentals of night photography, including focus, composition and exposure. You also need to have some knowledge of portrait lighting and how to use a flash. You also need to have an ability to direct your models clearly (and in the dark). Practicing on your fellow night photographers is a great way to start. Work between their exposures. Now that we've cleared the prerequisites, don't fret. You can learn simply by doing. Space on your memory card is free, so grab a friend and try it out. Note: Wanna level up your night portraiture skills? Join me for intimate group sessions in April and October of 2018 in Catskill, New York. Matt Hill is a partner and workshop leader with National Parks at Night. See more about his photography, art, workshops and writing at MattHillArt.com. Follow Matt on Twitter Instagram Facebook.